Catatan untuk anak-anak ibu yang tersayang ... THE PHRASE "WORKING MOTHER" IS REDUNDANT ! Alisya: Happy mother's day, Ibu! Ibu: Ohh thank you darling... I love you..
Alisya: I love you too .. So much! 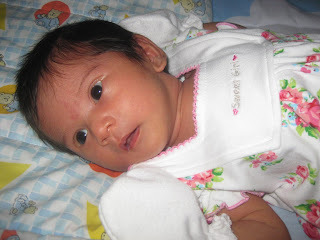 Ibu: Hmmm.... Alisya sayang a lotch tu sayang sampai mana? Alisya: Mmmm..... Alisya sayang Ibu sampai Rawang! Sekian lapuran Hari Ibu tahun 2015. And what did this ibu has got to do? Practice writing, and then reading ... aloud! Dari tadi tak nak buat homework. 1001 excuses. p/s So as you can see now ... my ramblings are not to impress others. Hardly ever! Just some notes of reference for my kids to reflect upon in the future. p/s Namanya pun 'cerita ibu' ... ni ler dia ceritanya. Nothing fancy. But truly the trials and tribulations that an ibu of four 'well spaced out' children (1 in ALevels, 1 in secondary, 1 in primary and 1 in kindy - beat that! ) goes through day in and day out. But hey... true happiness is not the absence of conflict. It is the ability to deal with it. So bring it on.... And I seek guidance from the Almighty to grant me the patience and wisdom to deal with each of those pangs and tribulations in raising these children. Has it already been that long since I last blogged? 2 and a half years!!?? I read Andrea Whatever's latest blogpost with a tinge of sadness, emphatising and symphatising with her predicament. Who doesn't love her daddy, ya? Little did I know, barely a day after, I had to face a similar turn of events. I was attending to a conference call at 7pm ish on Monday evening. Forgot to switch my phone to silent mode and lo and behold ...it went off in the middle of the call. I saw on the screen it was from my sister (Ibu Noi) but couldn't possibly answer it pronto and pressed 'decline'. I muted the phone instanstaneously too. Sorry kak! After the conference call, I went on to study a file for some facts & figures, for an urgent recommendation to be made. I completely forgot re Ibu Noi's missed call and only realised when I was packing home. By then it was almost 9.00 pm. I called her and apologised immediately. She sounded calm in response to my kelam kabutness mintak maap. Which was not quite ordinary of Ibu Noi. For Ibu and Ibu Noi, we are two of a kind, kembar siam of some sort (though 6 years apart). My kelam kabut typically begets her kelam kabut in return. So her calmness was not at all typical of her. Which I knew then - something was not right. In a calm and collected tone, she told me, bapak was not well. Yes, he was not well. BUT he was ok during Raya. We went beraya together to Malacca, the whole family. And he was ok when I left JB after Raya leave!?!!! Yes, but that was about 10 (or 12?) days ago. Slumped into my chair, numbed, not knowing what to think and what to say, I asked Ibu Noi if should I be going back 'home' (JB) immediately. She said I should discuss with Ayah but she personally thought that I should. I thought I should too. I called Ayah and he asked me to go home (Rawang) first as it was already past 9pm when I called him (from the office). On my way home, tears flooded my car. Being the youngest, suffice to say that it's undeniable I was very-very manja with Bapak. Always refered to as 'Anak Bapak'. Countless memories of my childhood and growing up with Bapak flashed in & out. Discussion with Ayah didn't take long, he simply asked to pack what's necessary and off we shall go. It was just Ayah & I, as baby Alisya was a bit feverish & coughing, and the two boys were almost already in bed. They also had to sit for their monthly tests the day after. We reached JB at about 2 am ish. We learned that this time it's not about his heart. His blood pressure ok, resting heart beat ok, thickness of blood (?) within range. And after consulting the attending doctor and weighing all opinions and options, they decided to bring him to rest at home instead of staying at the hospital. The ordeal was just starting. Bapak has been in and out of consciousness. He's now bedridden, cannot move on his own. When I was in JB last 2 days, there were moments when he was alert and fully recognised people around him, and there were moments when he completely lost it. I stayed mostly by his side, on his bed, that night. Don't think I slept at all, maybe dozed off once in a while whilst crouching next to him, trying my best to recite whatever I could whenever I could. As of Tuesday morning, he could still take in some rice porridge, though a very minimal amount. However, swallowing was an ardous task for him . Throughout the day and the night that followed, we all continued to recite surah Yaasin and other surahs, in congregation as well as individually, as often as we could . We took turns to stay beside him and whispered syahadah into his ears over and over again. Later on that evening, with the help of a young nephew doctor (bless him) who kindly did 'house visit' for bapak, he was put on sodium chloride drip via IV at home to reduce dehydration. His condition improved slightly momentarily. With some help, he was propped up a bit. He started to talk a bit. And we all gathered around him, taking turns to come up close to him & personally seeking forgiveness, one by one. He responded well, and recognised almost all of us, including the cucus and menantus. But as I said, just momentarily. That was, for the time being, the only time that he was fully alert. After about 1-2 hours, he regressed, looked weak and tired, and dozed in & out of consciousness all over again. There was once he nudged me softly with his elbow and asked for his porridge. But he could not swallow easily. And so the rice porridge had to be blended into puree form. And his Glucerna milk drink be spoon fed and plain water be sipped with a straw. We all continued to be by his side, reciting whatever we could muster. Every one, and I mean everyone (except for my own children who were in Rawang) was there. And everyone slept just anywhere. Ayah & I stayed on another night too. By Wednesday morning, his condition deteriorated slightly further. He could not swallow even a spoonful of plain water. So they had to use medicine syringe. left in Rawang. We concluded to return to KL but made plans to be back home to JB again Friday evening. And as of this morning, according to Ibu Noi, his condition has not improved. He couldn't even swallow the rice puree without spilling it out again seconds after. He managed to voice that he wanted to perform his prayer and my siblings assisted him with his wudhu and helped recite the prayers into his ear as guidance for him to perform his solat via eye signals and head movement. I listened intensely with sorrow amidst much hope to the few hourly phone updates from Ibu Noi or whoever managed to pick up my calls. Only my body is here. My mind elsewhere, somewhere in between some unfinished task at work and matters at home (kids, MIL, etc). My heart all the way in JB, hoping that Allah would grant time for me to be able to meet Bapak again tomorrow evening, InsyaAllah. To Bapak, kami akan usaha apa yg patut agar Bapak cepat sembuh. Dan pada masa yang sama kami semua akur dan redha akan apa yang terbaik mengikut ketetapan Allah. We shall do our best to assist you to recuperate, while at the same time pray and submit to God's will. At all time I stay reminded that everything is in God's willing. Kun Fayakuun - if he wills a thing, he only needs to command the reality of the entity and it shall instantly comes into existence. And at all time I stay reminded that so limitless is Allah in His divine glory, whose hand is the dominion of all things. Wa ilaihi turjauun - and to Him will all His creation be returned. Here I am hoping & praying for the best, whatever it could be. Can you imagine stuck in a meeting, having to concentrate on sales review, management accounts, P&L statement and bla..bla... 1 or 2 days before Raya? I'm not an Accountant....or anything remotely related to Finance. So obviously it was an arduous task for me to stay focused and pretend like as if I could stay interested on the subject. Raya mood overwhelmed me. Thank god the meeting finished on time. I rushed over to The Curve. The kuih raya that I wanted so much dah habis..... cisss.... And as expected, there was limited range of baju kurung for 11 mths old. The ones available were not pink ! (Yes...that's the theme for this year...just because of her. Yet she's still without her baju raya....kesiannya baby ku....). And the prices, mak datuk....mahal la pulak for just that small piece of cotton cloth! And all that took me to iftar time already... I rushed to 7 eleven, bought a canned drink and a bar of chocolate. Ate in the car while driving home. I still had so many things on my mind that I didn't recall singing along to the raya tunes on air. To be continued..... ni nak sahur. Last sahur for this Ramadhan. I've got to be at the table! It's a journey. Not an end. Yeah... I kind of miss blogging. But this is not the month to resuscitate blogging. Oh well.. Maybe I could do a bit of blogging if time permits in this holy month of ramadhan. Who created this concept of "if time permits" in the first place? If you want to do something, shouldn't you make time for it? Exactly my point. I kind of miss blogging. I am thinking that may be I should make some time for it. But I am reminding myself as I am typing this, that blogging should not be the first priority that I make time for in this holy month of Ramadhan. And back to my original intention of starting this blog - catatan untuk anak-anak ibu yang tersayang - if I do blog during Ramadhan, I would need to remind myself that my blog entries should then be all things associated with the memories and reflections or anticipations or hopes of this year's Ramadhan. So then when I look back in the future, or when (if?) the kids do read them in the future, we shall be reminded of us, of our family, and how we spend our times with or without each other in Ramadhan kareem this year. Meanwhile, salam Ramadhan al-Mubarak to all fellow muslims who happen to manage to divert their attention from facebook for a short while and take a peek here instead. May you find peace and harmony with yourself, your loved ones and the Almighty, the ONLY ONE, in this holy month. Hafiz... Puasa kerana apa? Bukan hanya kerana nak dapat pahala. Or kerana ibu. Or kerana nak dapat duit raya extra. Hokay? Ameer... "Puasa sambung2" pun sambung2 lah ... this year tak pe. Next year, lain cerita. Alisya... What can I say my lil princess? If only you know why I can't hold you too much longer after iftar & maghrib prayer this month, my dear. I'm sure you would know & understand later. Meanwhile, be good and sleep tight ok? To Ayah, my hubby... let's pray that we would have the strength to continue this journey that we started 4 nights ago. A journey which path is crystal clear only during this holy month of Ramadhan. If time permits, I mean, we shall try to find some bit of time ... to further improve the rempeyek attempt and hope the rempeyeks will not be that "well done" (photos later peeps) next time around. ROTFL walau dalam keseriusan!!! Just read a text message from WanShana re the demise of Allahyarhamah Dalilah Tamrin, or better known as Raden Galoh in the blogosphere. Received this in my mailbox sometime back. Didn't read it instantly.... one of those that I send to 'nice to read later' category.... Glad I took time to read it finally. The people who make a difference in your life are not the ones with the most credentials. The most money...or the most awards.They simply are the ones who care the most. 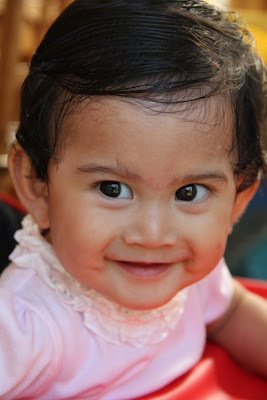 Baby Alisya, now only 8 months young! I first thought.... let's simply dressed up in Baju Melayu & Baju Kebaya - ala-ala P Ramlee & Saloma. But.... hey..... I no longer have the 'pinggang macam kerengga' to fit into any Saloma-like outfit, that's for sure. So, cannot lah. Then I thought, alah.... why not as James Bond & any of the Bond girls..... Ayah can dressed up smartly in black suits and I can slip into ( read as: buy new!!! yeay....) shiny swaying slithering long dress - all covered up for sure. And then I figured.... ohhh... so he was willing to waste time to think of what outfit to wear la ye? Semangat pulak nak dress up, abang aji ku ini? Oh yes.... don't forget.... he's just been elected as the new term chairman ( or is it president ?) of the sports & recreation club. So he's got be 'in the zone' laaaaaaaa kaaaaannnnn? So off we went searching for suitable outfit. There were so many options! Ranging from Disney movie characters (Snow White, Cinderella, etc) to super hero movies (Batman, Spiderman, Superman, Kluangman jer tak de!). But it was a real challenge for us. The characters that we thought we could 'menjiwai' ; like Cleopatra & Mark Anthony for example (ekekekeke..... perasan), the outfits were not so nice looking. Rather, tak muat la actually.... Haiyooooo... serious in deep trouble. Someone recommended a costume shop in Sunway Damansara (ohhh....sepelaung jer dari kedai runcit ku itu....) and we dropped by the shop with much hope that we could find something that we could wear ( read: that we could fit into! ). (and because they have S, M, L & XL sizes for the trousers). I simply tagged along..... as one of his chosen movie character's latest girl. Reading the 'story' from The Star today, related by a friend of the late Amirulrasyid (who died in the fatal shooting in Shah Alam) brought tears to my eyes. There has been a lot of speculations and views on a lot of related matters - curfews, access to cars, etc .... I don't want to make any comment here. Suffice to say, I have 3 boys to worry. Yang bagus jadikan teladan, yang kurang jadikan sempadan. As with everything else - maktub. House hosting a 'meeting' ? Nahhhh... not yet. Not so long ago, Ayah voiced out, he was thinking maybe he should have the inaugral meeting with the new committee members of the sports/welfare club (of which he was recently elected/appointed?/paksa rela? as the President - or is it Chairman?) at our house. And I went like.....GULP !!!!!! Alamak.... the immediate question that came to my mind, err...Mr President, Sir, your wife kena masak ke? I've hosted a meeting with my team members at our house too before no doubt. But that was a day before I went into labour - who dared to stress up a lady with fully blown up tummy? And it was fasting month. How convenient.... bulan puasa memang tak payah serve food. hehehe.... nevertheless....regardless.... those who could not fast or non muslim, still should have some snacks right? But you see.... these were my bunch .... who have been brainwashed since whenever, that this colleague of theirs or perasan like boss sometimes .... simply DOES NOT COOK. So come you may if you so desire, but help yourself to whatever there is in the kitchen. And this cool bunch of memang no need to control macho type really helped themselve they did. The minute I said, let's have a break.... bertaburan la they all roamed into my kitchen, checking the pots & pans, biscuits/cookies in the jars, chips in the snack baskets, fruit juice & soda in the fridge, and hot drinks at the drink counter. Some even befriended Bibi and got handsomely rewarded with heated up masak asam pedas which they gobbled up with white bread (roti cicah kuah asam pedas pekat , pernah try? sedapppp.......). Eh! Wasn't it fasting month? Yes, it was. Those who were fasting memang ler puasa..... But those "uzur" and non muslim surely knew how to have a feast in my kitchen! In the end, they were fully seated around my kitchen table menjamu selera with whatever edible they could find. HAHAHAHAH..... kesian sungguh....and kelakar sungguh....... And they really enjoyed themselve very much. If only I had snapped a photo! But you see... this was ....my bunch. The kind of bunch that... err... what did I say just now? Err... the 'no need to control macho' bunch of gals/guys. The kedai runcit bunch of people whose working life revolves around 'sourcing & finding for food' come what may anyway. Back to our newly appointed Mr President. For you Mr President, you really should not hold your inaugural meeting in our house, Sir! Because Mrs President is simply incapable of providing the support at this juncture. Your new committee members may not survive the creative challenge on the search for the unserved food/drinks. Your newly appointed committee members look up to you I'm sure. And I think they have a damn good reason to do so. And should continue to do so. I don't think you should risk your reputation too early in your appointment, Sir, simply because of the lack of a certain competency on the part of your other half. Don't shake their confidence too fast too soon. Not good for your credibility. THIS DOES NOT IN ANYWAY WHATSOEVER RENDER YOU, MR PRESIDENT, ELIGIBLE TO HOLD ANY SUCH MEETING IN ANOTHER NEWLY ACQUIRED HOUSEHOLD YG PANDAI MASAK PULAK KONON !!!! THE IMPLICATION OF SUCH MISINTEPRETATION IS SIMPLY DISASTROUS. BE WARNED. Good school, good results... so what? We found out about SBPI Rawang.... 15 - 20 mins away from home. Waahhhhh.... very close indeed. I had no clue (asyik clue-less jer Ibu ni?) what "Integrasi" meant then and thought little of it. Did not do any research or enquiry on the school academic records, the teachers' capability, the standards of the hostel, etc, etc .... So long the school is near to home, fine by me. Yes - near to home was the key deciding factor. A bit embarrasing at times when some friends or other parents asked why we chose that school, why not the premier schools, etc, etc, and I had to sheepishly answer, "Err... sebab tersangatlah dekat dengan rumah? So tak lah Ibu rindu sangat dgn anak sulung dia?". And my friends would tease me, woi... nak hantar masuk asrama ke tak nak ni? By the way, SBPI Rawang is in Bandar Tasik Puteri, Rawang. And approaching the school, there is this road sign depicting "lembu crossing". Get the drift? This year, SBPI Rawang is listed as one of the top 10 (government) schools based on PMR results and also the latest SPM results - alongside other bigger names. Abang Idin is happy. Proud for his school. Nervous at the same time. Thinking... alamak... he is the future generation to maintain similar if not better results (good wake up call for him la kan?). Ibu? I should be happy right? That the school which was never known to many before, is now listed as amongst the better ones? Maybe I should be happy. Of course I am. But heh...actually more nervous than happy. So the school is proven that it can be 'good' - based on academic achievements. But would it nurture Abg Idin to be better than just achieving good results? Would it help Abg Idin develop a well rounded personality? Would it prepare Abg Idin to be self sufficient and independent - from otherwise the familiar style of microscopic monitoring and/or constant nagging by teachers/parents/seniors to do what he's supposed to do (homework, revision, riadah, solat, mengaji, ibadah, etc, etc)? Would it instill in Abg Idin the necessary ingredients to help him ultimately develop into a good faithful muslim? Maybe I am thinking too much and that I should let it be and see how he develops? But nahhh.... I think it's good to bear these questions in mind. So that I can remind myself - things won't just happen. We have to make it happens. The school is just the infrastructure - roof, pillars, classrooms & dorms. The students, with their hearts & minds, are the intellectual capital. Everything else is in between - to help achieve what every parent's heartfelt desire and wish for their children. Usaha, doa ... then baru tawakkal. "Ameer.... Don't be so lazy OK! Dengar lah cakap Ibu! Jangan sepah-sepah toys!" "Alah toys jer... tak pelah..."
"Ameer ni! Tak sayang Ibu ke? Nanti Ameer tak boleh masyuk syurga tau! " "Kenapa tak boleh? Ameer bukan naughty. Ameer nak main toys jer...."
"Kalau Ameer sepah-sepah toys, Ibu terpijak, kaki Ibu sakit tau!" "Nanti Ameer hug Ibu & cakap sorry lah! Nanti dapat masuk syurga kan?" "Ishhh ....Ameer nih! Kalau kaki Ibu sakit, macam mana Ameer nak masyuk syurga! Syurga tu kan bawah tapak kaki Ibu!!!" 1. After several failed attempts, you have no choice but to just wait for your 6 year old son to return from school to help you switch from Astro to DVD player - because you have no clue which remote to use for what and which button to press and what the difference is between AV and REAR .... and even if you get that far as to have the menu appear on the screen - you still don't know how on earth to unmute the box. 2. Your 8 year old boy, in his quest to earn some extra pocket money, opts for "cabut uban ibu" as the faster & easier way. RM2 in no time at all, at a rate of 10 sen per uban. 3. You have to borrow a piece of "koyok" from your mom to soothe your own back pain, and promise that you will definitely return one piece to her because you yourself will be buying one whole box very soon. 4. It's the Analene (milk) promoter rather than the Sunsilk shampoo salesperson that is more friendly to you on the supermarket floor. 5. Your insurance agent keeps suggesting that you choose the more 'balanced' product for your investment link portfolios and stay away from the high risk high dynamic options to mitigate the risk of emptying your retirement fund too fast too soon. 6. You go downstairs to the kitchen to fetch something but when you get there and open the kitchen cabinet, you have a hard time recalling what is it that you are looking for. 7. You place an order for teh tarik, and the waiter asks "nak kurang manis ke?" 8. You hum Kate Perry's "You're hot & you're cold" and your nieces look at you in awe and say, "wowww busu! you know that song? cool..."
9. The travel agent promotes and explains at length the "ease and comfort" value deal as compared to the light touch on "fun, thrill and exciting" package. 10. You fill up for the membership form for any retailer loyalty card and have to tick the second last box for age category. Ma'am - why is it that when I do right -he never remembers? ? Never recognises and never says thank you? Never ever! But when I do wrong...... he immediately spots it and highlights there and then. He never ever forgets to blame me right away? Why? I don't know really... do you want to tell me more? Who is this person by the way? Your line manager? And what is this all about actually? Is this about work? No Ma'am.... It's my husband. The transport lady could not pick up our son from school today. She called me this morning. So I am supposed to arrange for alternative. But I completely forgot. I was so busy today and had meetings back to back that I totally missed to call my husband to ask him to pick our son from school. He called just now, scolding me like mad because our son had to take a lift from someone and just reached home. Quite late la Ma'am. I know it's my mistake. I'm so scared when I realised I forgot about it. Safety wise! But it was not intentional at all. Which mother doesn't care for her children's safety? He ... my husband, what did he do? Nothing much Ma'am. He didn'tcare to lift a finger at all before this. No attempts to help me find school bus service, no initiative to ask anyone from the surau for car pooling if possible. No nothing. To top all this, even when I've been the one making all this arrangement... would he at least offer to pay for the transport? No Ma'am. I'm still the one paying for it. How la Ma'am? And then today.... just one thing I forgot to do .... he..... happily taruh me... as if I am a totally useless mother..... like I am so stupid because I didn't call him straight away to arrange for transport. The thing is Ma'am, sometimes, even if I called also.... either he would be in a meeting or discussion and said he will call me back and then he never call back - and if I called again, he didn't answer my call, so I still ended up having to crack my head to make alternative transport arrangement. But today I really tak sengaja you know Ma'am.... I know it's my mistake. But I was so busy today that it completely slipped my mind. My husband Ma'am, he so heartless one.... he made me feel so guilty.... But all these while...... who was the one doing all the run arounds? Did he ever care? Did he ever help? Never.... Today, one mistake.... he never forget to immediately make me feel lousy like this. I see.... so what do you plan to do? Is there any specific help you need? No la Ma'am...... sorry to bother you.... I ... I just... I just want to let off my steam Ma'am. It's been bottling in me. I cannot stand. I know if I still keep inside, I can go insane Ma'am. I shouldn't really bother you with this. Because I know I have to sort it out myself. But just sharing with you help release the tension, Ma'am. Sorry to kacau you but thank you at the same time for listening to me. Just voicing this out and having someone to care to listen already helps..... eh.... thank you la Ma'am. Thank you so much for listening to me. I'm so sorry to bother you. I know you are busy, thank you so much for accommodating me. Oh... No worries. It's the least that I can do. Are you sure you don't need any help? Yes, yes Ma'am. So sorry to bother you. Okaylah Ma'am. I'd better not hold you up much longer. Thank you again, Ma'am. Thank you. No problem. No problem. You take care ya? Yes, yes, Ma'am. I will try. Thank you very much. I reflected for a while and my mind started talking ..... petty issue it may seemed .... but was that early signal of cracks in marriage? Work life balance? Gender equality? The kind of work whereby 2 + 2 does not necessarily equal 4. And where returns on investment of time spent at work cannot be easily quantified like some other colleagues on the board. It's almost 1 month since he started going to the big school. Still crying tau........ Haiya...... 10,000++ employees can handle (I think can la....). Anak sorang masuk standard one kelam kabut. How? Every morning got mini drama in front of his classroom. This morning siap peluk2 tiang some more. Kalah hindi movie. The class teacher tried to pacify me; tak pe lah Puan, tiap2 tahun pun mesti ada satu dua yg menangis macam ni. And this Ameer, pujuk-pujuk also not working (yet). Some more can call me at the office (every day after he returns from school) telling me how long he cried in the classroom. If I am in a meeting, siap leave message pls call back, very important. "Ibuuuuuu....esok Ameer tau Ameer akan nangis lagi.... air mata banyak keluar........"
(Very visionary... he plans for tomorrow you know). Tak larat dah nak pujuk. Now I just respond, hmmm....... nak nangis? nangis la... tapi jgn banyak sgt air mata keluar, ok? Nanti buta. But I didn't know it can cost so much wohhh! Brought Alisya for her immunisation - the 3 in 1. 1st jab muka selamba. Tak nangis pun. Terror. 2nd jab ... hahaha.... terus broke down. But just a shortwhile. Girl power! I remembered Abg Idin & Hafiz dulu, I think the whole hospital trembled. Other than the itemised cost for consultation fee, the bill originally only stated 'medicine' with a lump sump figure. I asked for the breakdown and the cashier was understanding enough (my terkejut beruk facial expression could have thrown her off balance I tell you!) and she helped print out the itemised cost for each of the vaccines. I wonder..... was it the cost of vaccination that has really gone up since the last 6 years? Or was it the hospital that 'strangle blood'? Must check around how much it costs other mothers for the same 3 in 1 jab like this. p/s My lil' princess Alisya.... when you can read this in the future.... hah... ingat tau! Bukan 'murah' nak membesarkan anak2 zaman sekarang. I hardly tuned in to Radio ERA these days, but I did so recently when I heard Aznil's voice cracking with sadness. Apa hal la ni agaknya? I thought since I am 'working' on my "feeling" side (which score was very miserable in the MBTI profiling... hehehh...), maybe I should listen for a while. I'm glad I did. Though I still am not quite sure how to describe my feelings about it even to this day. This one pakcik with utagha slang was on air, relating to Aznil the incident of him being disposed off by his own flesh & blood son at a bus stand after he (the Pakcik) had just undergone an angiogram. Earlier - when he returned to his son's house, his son's wife (i.e. his daughter in law) had cleared away his mattress & pillow and told him he could not stay in the house any longer. He asked his son to send him back and yes, the son did so - but he just dropped him at the bus stop, that was it. No reasons given. He said he's now putting up an old folks home. He still doesn't know what he had done wrong to warrant such ill treatment by them, especially his son, whom he had "bela dan didik daghi kecik sampai la ke besaq dengan kasih sayang dan didikan agama segala". He would welcome his son if he ever wanted to visit him but would not want to see his daughter in law - ever again. Whatever their reasons maybe. This old pakcik just underwent angiogram. I thought of my father. My father who was once a tough marine police officer, whom many many years ago used to fondly carry me on his back (piggy back) each time he came home from his off shore patrol duties. He who once told me how embarassing and mengada-ngada I was for not wanting to take part in the "Hari Polis" kids telematch. He who used to bring home almost all of his food rations and gave them to his wife and children instead of consuming them for himself while on rough waters. He who ignored me when I nagged him to buy me an ice lolly - just because I was having a bad cough at that time. He who once dropped everything that he was doing when he saw my face got swollen all over (poison ivy) and dragged me all the way to Hospital Besar JB on a public bus to make sure I got immediate medical treatment. He who used to visit me almost every weekend during my 1st year in STF - on his motorbike - if he was not off shore, bringing with him whatever home cooked meals my mother prepared and some snacks if he could afford to buy for his daughter - who kept telling him that she wanted out because she was deprived of healthy food in the hostel. He who did not disagree with me when I said, "Bapak, you don't have to give me monthly allowance anymore now bapak, because JPA gives me some meal allowance and I think I can survive". He is retired and very old now. He's also suffering from heart ailment and went through angiogram & angioplasty procedure not so long ago. It's payback time now. Transferring some meagre amount of money for him and my mother every month, insyaAllah. Sending him to the hospital for planned doctor's appointment. Rushing him to the emergency unit if angina attacks, nauzubillah. Fetching his medicines every month at the hospital's pharmacy and sending them via courier to my sister who would then 'dispense' the medicines to my father. Scolding him for sneaking in the middle of the night for a scoop of chicken or beef curry that was served over dinner but which he was not allowed to indulge together due to his high cholesterol and his heart ailment. Keep reminding him of my sons' names each time we balik kampung because he keeps forgetting who is who. And when talking to him, in person or over the phone, raise my voice to the point that people may misperceive as "kurang ajar" but only because he could not hear that well anymore these days. 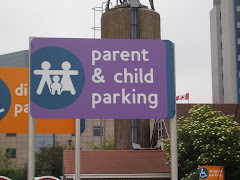 I hated it when I have to leave my father alone at the hospital's lobby while waiting for me to pick up the car and make the rounds from the parking lot to fetch him. I imagined and shuddered at the thought of leaving my father alone all by himself at a bus stop to catch a bus home. I am not much of a feeler. But this time it doesn't FEEL right at all. It doesn't feel right that someone can treat his old father like that. Whatever the reasons could be.... It doesn't feel right. And today another story in the newspaper. A son, a medical student on a study break, beat his old man with an iron rod and slashed that poor old man's finger with a knife because his old man refused to give him RM1 million (!!!) His 50+ father is a company director with a government linked company and had recently undergone a heart bypass at the National Heart Institute. His wife is a department director of a government agency. Apa nak jadi? Miskin susah. Kaya pun susah. I have 3 sons. And now also a daughter. Started with Awal Muharram. Then 1st Jan. Coming soon, CNY pulak. Where did the year go? Pejam celik pejam celik dah habis setahun. Kesampaian tak last year's 'new year resolution'? Eh? Did I have any? Nak kena scroll back to last year entry if I had any. If there's one new year's resolution that I would want to TRY to achieve this new year, is to blog more often on timely basis. That's the only way for me to be able to recollect "where did the year go" type of question. And more importantly, to fulfill the reason for this blog; 'catatan untuk anak-anak ibu yang tersayang'. Having said that, rasa macam susah la pulak nak capai. Just look at the list of topics below that I have missed to update or complete since the last 1 or 2 (or maybe 3) years! 17) Ayah's project "Bumi Hijau"
There is this saying, if there is a will, there is a way. Looks like I've got to balance the above two. So that hopefully, this blog won't be that dusty in this new year moving forward. Meanwhile, it is still not too late to wish all of you a very happy new year! 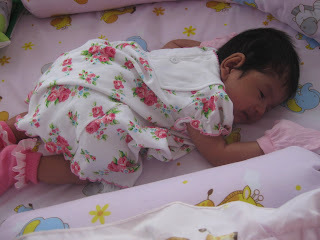 We missed to have it on the 7th day as baby Alisya was still under observation at home - recovering from jaundice. Couldn't do it immediately after confinement either; for some other reasons I can't remember (surely not good enough a reason, else I would've remembered). Couldn't have it during the recent Raya Haji break because Atok was scheduled to undergo for his eye surgery around the same time. He wouldn't be able to read his kitab berzanji and hence who to lead? Ayah? Err... I don't think "Syurga di wajahmu" is enlisted in the kitab. And so if 'menurut kemampuan waktu', I figured we should have it during Awal Muharram: a long weekend, plenty of time for relatives & friends to come over, from near & afar. And plenty of time for them and us to recuperate thereafter. Besides, it coincides with the welcoming of the new year. Perfect isn't it? Can't be any better. Somehow I did NOT pencil it in my calendar because ....errr...i know this sounds lame, but I was still on confinement when I thought of the above date - which means I was at home then, which means my ever so efficient assistant was not around to help update & block this date in my calendar for this glorious ceremony for the lil' princess. Being away from office had this inevitable impact of steering me away from the concept of real time. Is it that obvious that it was sheer laziness that held me back from jotting it down myself? (blame it on the raging post natal hormones.... and besides ....i was supposed to be on leave, wasn't I? got excuse maaa....hehehe). Anyway, if it is to coincide with the new year, how could I forget it? It's not that difficult to remember. The radio and TV would surely be trumpeting the new year count down. So nothing to worry mate. All under control. Or so I thought. But errkkkkk..... I was wrong. For the past few weeks, in my mind, I kept associating it with the'new year'. It is the 'new year' indeed. Except that it is the new year of the muslim's hjrh calendar and NOT the gregarion calendar. And the new year that I should really be planning for is less than 1 week away. NOT 19 days. My mind has played a trick on me. NOW on your mark, get set, GO! Run Ibu, RUN!!! Catch that lamb if you can. And go find a pair of silvery scissors. This sounds like I've thrown myself onto the pitch again, for the new season of an Amazing Race. When the going gets tough, the tough gets going. I am so fond of last minute sprint like this working under extreme pressure, or to borrow Kak Yatt's (No Time Off) term that I've just learned; "jamak ta'khir" stunt .... eyyy... hehehe.... sabor jer lah! Frankly... I don't quite like the title. It feels like I'm not focused. And I'm about to ramble. But yeah... I am about to ramble. Hence, tak pe lah .... there's always an exception from time to time. Did he just got a windfall or durian runtuh that he's not telling me about? First the GPS. Then the waterjet (just the waterjet - not the 'ski' yet hehe..). Then the PC mobile speaker set. And he's also been talking about upgrading his handphone. He's even contemplating on the k-ok set like our friend TAB owns. Anyway... it's his money la kan? But of course I did remind him - Bang, jgn lupa register for Qurban ya? p/s Wouldn't it be nice for a change if once in a while kaum Ayah shop spontaneously for baby's clothings? Or baby's toys at least? I did say once in a while kan? He missed an entire section of his English final exam paper (name the body parts of an animal - an elephant). Berangan jer budak sorang ni. I always had to remind him of the F word. FOCUS!! And when I asked him how come he missed that one whole section worthy of 10 points, he replied "Sorry Ibu, I guess I forgot the F word". Hmm...pandai pulak dia menjawab. Anak siapa ni? And he quickly answered the questions - easy peasy full 10 marks - but way too late. The irony is, with whatever remaining marks, he actually tops his class for English. And he tops his class for Science too. Sikit lagi full mark. By the way, Hafiz ni 'alphabets friendly' (now that's new....) for the time being. He didn't just score straight A (Science & English so far) but also B (BM so far) and C (Bahasa Arab so far). Awaiting Maths paper anxiously. Hopefully not D !!!! Sony PSP is at stake here OK? He is definitely following my footsteps when it comes to 'shopping'. Everytime we go out, he surely wants to buy something. No matter how small or how cheap. One day it's a Bakugan. Next, Ben 10. Another, Bumble Bee or sedara mara Transformers yang lain2. Quite a natural negotiator this one. His typical modus operandi: He will first pick an expensive one. And when I say "No Ameer! This is too expensive! ", he will quickly go into scanning mode and grab another one that is, say .... one fourth of the price. He will run back to me and while still gasping for air - he will grab my hand and look into my eyes like a little lost puppy; "Ni murah je Ibu!". Has he been reading my kedai runcit minutes of meeting on competitive pricing or what? Hmmm.....Anak siapa ni? Sometimes I managed to switch his picking to another useful item. Like a tomato plant seed. So now he's experiencing live farming. Only problem is, I now have to answer the same question every now and then, "When will my tomato plant grow, Ibu?" or "What time of the day today will it grow the tomato?" . Padahal baru 2-3 hari tanam. LOL!!! Oh! By the way, I got myself some seeds too. Tapi yang menanamnya Bibi... no surprise there ya? And during dinner last 2 nights, Ameer asked, "Ibu.... when will your PLATYPUS grow?" Ayah & I both ... what platypus? He was quick to clarify " Alah... the seed, the plant!". Ohhhh.... PETOLA la Ameer.... PE-TO-LA!!! Bukan platypus. Safely tucked in his hostel. Still wanting us to visit him every weekend - which is kind of mutual. Each visit I have to ask him, "What did you lose this time?". Ada jer barang hilang. Track bottom. Belt. T-Shirt. I kept asking, eyyy... sekolah 'integrasi' (i.e. sekolah agama turned full boarding school) pun ada yang panjang tangan ke? His reply was, "Sekolah yang Integrasi bu. Not the students...) Hmmmm....Pandai jugak dia menjawab. Anak siapa ni? The last draw for me was a very new Adidas T which was meant as a reward for something. What was it? His TaeKwando tournament ke? Tak ingat. I said, that's it. No more branded t-shirts to be brought to school. Yang tu kalau nak, kalau Ibu mampu lagi la nak beli lepas ni, you can only wear them during school hols. Surprisingly, he also agreed with that suggestion. Generally, they (the kids) suspected the makcik cleaner. Once they saw her wearing a track bottom belonging to one of his dorm mates. How did they know? Oii.... terpampang nombor pendaftaran dobi on the side of the track bottom. Alahai Makcik!!! But as for the branded Ts - I think it may be some other kids la. Don't think the Makcik cleaner can fit into Abang Idin size XS t-shirts. So there goes my rambling on this and that. Happy day ahead people! 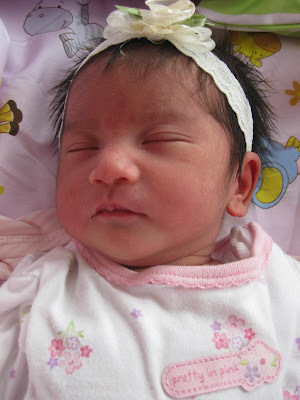 Baby Alisya has lost her newborn look and smell. But still constantly commanding attention like Ms Universe. She now appears steady and alert when held upright. She smiles back at me more frequently now during our coos and gaga sessions. Oh.. she can pout her lips too, almost mimicking Amber Chia. I guess it won't be long before she can roll from back to front, or front to back. By the way, I just discovered the weighing scale is actually out of order. All these while was thinking I'm one below 60. Until few nights ago when Ayah stepped on it and the scale still read one below 60. Yikessss! I'm doomed. 7 more days to go. Don't think I can get back into my office attire..... I should really join Alisya in her press ups soon. I am declaring WAR against those ants!! How could they trespass our territory? Baby Alisya's territory to be exact. She hardly cries (except for her feeding) and to hear her sudden outburst - and seeing those army of ants marching in the not so straight line in her crib really made my blood go upstairs. How dare you terrorise and cause grievous hurt to my baby?!! Ayah turned 42 yesterday. True, only 42. Eventhough he can pass as nearing warga emas age judging from just his silver hair alone. That is if you only look at his hair la. He still carries with him his boyish look. Albeit with a few wrinkles here and there (and the grumpiness now and then... ekekeke!). Happy Birthday, Abang! With much love. I managed to grab tiny tots that the boys chose for him. Those are their birthday presents for Ayah. Moi? I haven't bought any birthday present for him (yet). I have a good excuse; 'langkah tak berapa panjang' for the time being. Still mainly around Rawang town only. Here in Rawang, we have Parkson Ria, Popular bookstore, Giant supermarket, Bintang & Mydin department stores and NSK cash & carry. Tesco is still under construction and will only open in a month or two. Which means, nothing much of manly gadget offerings or IT gizmos (imagine Imbi Plaza or Low Yatt ok?) for consideration. No - the rows of hardware shops in Rawang that boast a wide variety of gardening tools, DIY equipment and the likes - do not count for Ayah. Those kind of backbreaking and sweat inducing tools are not for him. Unless of course if they have a DIY 'rocketeer' to make one elevate or fly in style? Don't think they have that. Not in Rawang. There are the typical eating outlets like KFC, McDonald, Pizza Hut and some others like Secret Recipe, Delifrance and Bangi Kopitiam which I can drag him, I mean invite him, for a semi romantic meal for two. However, I'm sure I would keep looking at the watch thinking; 'alamak...baby dah bangun ke?' or 'baby nak nenen ke?'. That would further discount the semi romantic meal for two. Home delivery pizza for the whole family maybe? Except I probably only have RM50 in my purse. The last time I asked, the delivery boy didn't carry any hand held credit card swipe machine. Banyak nya excuse I can come up with kan? I'm sure a hearty home cooked meal would be lovely, some would say. I'm sure it would be. But I don't know when that will happen in this home. So husbands from those homes with such lovely home cooked meal - be thankful. The ones that I can manage, like the ever so sedap and finger licking sambal telur that only Ayah & I enjoy (hahaha), I already cooked last weekend. In hindsight, I should have spared that for his birthday. So no special home cooked meal for Ayah from Ibu for his birthday. Some would probably say ... alah.... why the fuss for just one day? It happens every year anyway. Having said that, to be honest - actually .... there are some windows of opportunity that I could grab to go buy him something or organise a mini birthday do with the boys (eh! 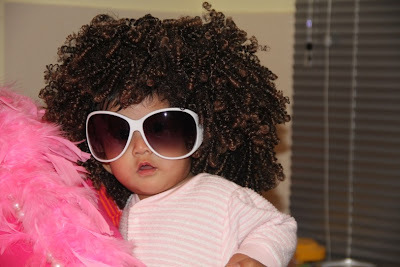 and the little girl too!! ) like we usually do, if I really want to. That's it! If I really want to. Does that mean I do not really want to - make the usual fuss - for Ayah's birthday this year? I feel sad, really. For allowing myself to NOT making enough effort for Ayah's birthday fuss this year. Then again, I am fully aware why I indulge myself with not really wanting to do much of anything for his birthday this year. We didn't even gather around him at bed time to sing the birthday song. How pathetic is that?! Sad but true. Eh! Hang on a minute! Maybe I can tie a big pink ribbon or pink bow around Baby Alisya (after fully bathed and dolled up in pink, dah wangi2 semua tu.....) and hand her to Ayah for him to cuddle? Hey.... that would be quite different. Ya.... maybe I would do that. Now.......where (and how) can I find a big, gigantic, humongous pink ribbon or pink bow in a jiffy before he returns from work tonite? Tell me. Before she turns 16, I might as well get cracking with whatever that I have on my mind. 6 weeks have gone and what have I discovered? Nothing can really fully prepare one for the reality of having a newborn baby. At least that's how I feel. The first few weeks of Baby Alisya's life seem like a chaotic whirlwind of new experiences and sensations, as we all get to know this new little princess that have come to join our family. And I still have not given any update or further detail re the little princess. Today, I just want to share or rather confess ... that I have not managed to do much since the last 4 weeks. Other than taking care of the lil' one and bonding with her. The rest of the items in my checklist are pretty much still left unchecked. Made some "ais krim malaysia" (you know, the one in long plastic tube tuh!) - sunquick orange flavour, for the boys. Maka semut2 pun sangat sukalah merayap2 menghidu sisa2 aiskrim yg merata2 depan TV tu - much to the annoyance of Bibi. My house is in a mess. I am in a mess. Oh my!! Teruk nya.... And I invited some friends over for BBQ some days soon? What was I thinking!!???? First things first - update the profile. My introductory profile on the right hand column cannot be updated yet. Yup.... still mother of three, for the time being. It must be very cozy 'in there', kan? Syiok dia dok dalam tu. And I can't be updating hour by hour pulak by now kan? The countdown? Ekekeke.... konon. Meanwhile, say a lil' prayer that everything turns out well ya? Ma kasihhhhhh.... berkat doa di bulan Ramadhan ni kan? p/s Nama pun belum decide lagi. Missing since 9th Jan 2008.